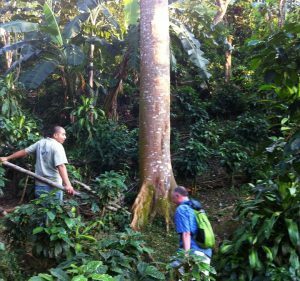 The El Toledo Permaculture Coffee Farm tour was one of the highlights of our visit to Atenas, Costa Rica. Gabriel, one of the owners, gave us a great coffee education, showed us their operation, and explained to us about their farming practices. He used a wooden tray filled with green coffee beans as a visual aid. We were encouraged to ask questions. A couple of our fellow tourists even booked a day of volunteering to come up and help with the harvesting of the coffee berries. The farm is owned and run by an extended family who have lived there and worked it for many generations. Gabriel shared with us the story of their transition from conventional to permaculture farming. 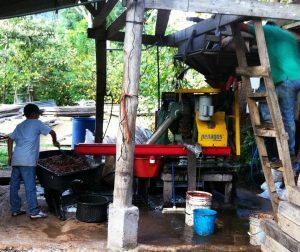 Meanwhile, his mom was there grinding and brewing coffee for a blind tasting and his father was pressing the freshly harvested coffee fruit and extracting the beans. We saw beans drying out in the sun being prepared for roasting. Gabriel explained to us that his father had become ill from the chemicals they used for conventional fertilizers and pest control, so the family had quickly converted their practices to organic farming. In this process they lost a large portion of their income and family members had to resort to other trades for the five years it took to get the farm up to production. These days he teaches his neighbors about permaculture and encourages them to make the transition more gradually so that they can continue to support their families. During his presentation, we noticed toucans feeding nearby and learned that feeding the birds is part of what the family does to bring insect eating friends to the farm. They have also learned to let the “weeds” grow and to intermix their plants. 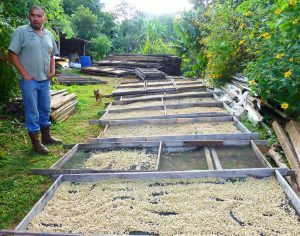 He shared that they now feed the family largely from their own garden and roast their own beans and sell their coffee locally. They have less of a need for income now that they can feed themselves. And his papa is healthy and strong again, selling the beans each week at the local farmers markets. 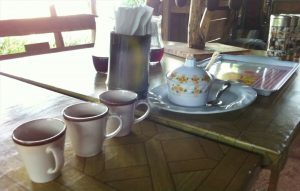 We enjoyed a coffee tasting of light, medium, and dark roasts brewed at the table in a traditional Costa Rican drip device, a chorreador. We were surprised, during the blind tasting, to find that we both loved the light roast coffee. We are both committed French Roast lovers and we may return to that in the US, but the lovely and complex flavors combined with proper brewing methods made a full bodied coffee that is quite delicious. Gabriel taught us that French press made coffee has more caffeine, drip coffee has less. Paper filters hold back caffeine as well as oils and hence flavors. We learned that darker roasted coffee has less caffeine than lighter roasts which have more caffeine and also more different flavors. Darker roasts have fewer, stronger flavors. Gabriel likes them all depending on time of day and what he is eating. We also learned that the beans expand when roasted, and become lighter. 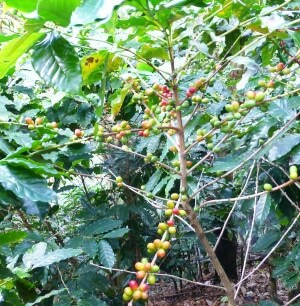 We were encouraged to buy locally roasted beans because coffee doesn’t start to lose its flavor until it is roasted. 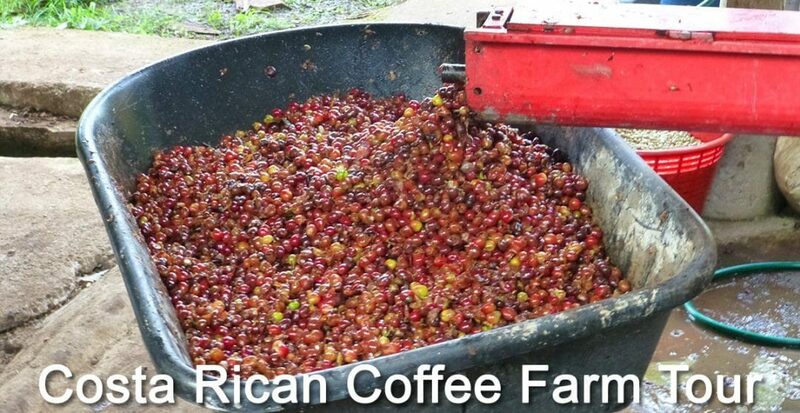 Green coffee is cheaper to ship and less wasteful of resources. So, instead of loading our suitcases with roasted coffee, he suggested we go to a good local cafe near home where the beans are purchased from sustainable farms and roasted on site. 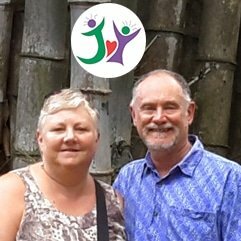 It was such a treat to walk around the terraced coffee farm with Gabriel as we learned which plants were around us, saw trees he had planted as a boy and met his wife and baby daughter. His nephew pressed us fresh sugar cane juice at the end of the tour. The cool weather and gorgeous views in the hills just beyond Atenas were a delight, as was this warm and loving Tico family. Working with nature, they have been able to sustain yields while at the same time improving the land, and improving their lives as well as the lives of their family and neighbors. We are so glad we had a chance to share time with them. 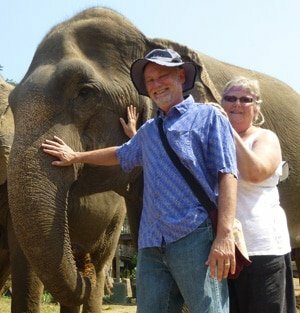 A really interesting post Laurie, I\’d like to visit a coffee plantation some time and particularly interested in a blind tasting. That way you really would find out your true preferences.